Few, if any, developments in the postwar era possess as great a significance as the rise of Japan. Normally, Japan’s rise is discussed in economic or political terms. Its religious significance, especially for a nation such as the United States whose cultural inheritance is so deeply rooted in biblical religion, is seldom discussed, much less understood. Japan is the world’s most successful nation with non-Christian roots. Even the Soviet Union has Christian roots. Marxist atheism is grounded in the very biblical tradition that Marxism negates. Moreover, the apparent conflict between the Western proponents of a biblically grounded attitude and a secular ethic takes on the appearance of a family quarrel when seen against the horizon of Japanese religion and culture. Far from being the antithesis of biblical region, the secular spirit that pervades so much of Western life is its unintended consequence. Wherever the biblical faith in a unique, exclusive, extramundane God penetrated, it was utterly destructive of indigenous gods and traditions. Sooner or later this polemical, desacralizing faith was bound to give birth to a consciousness that would not rest until all the gods without exception were dethroned. Under the circumstances, it is hardly surprising that a civilization as determined to preserve its own integrity as that Japan should marshal all its forces to resist both the believing and the secular manifestations of biblical religion. The Japanese have created a thoroughly modern, highly technological, capitalist civilization whose religious foundations rest upon animistic and polytheistic traditions that adherents of the biblical regions normally assume to be discredited, primitive, and idolatrous–a remnant of a far earlier stage of religious “evolution.” From the Japanese perspective, such views are, of course, utterly without substance. We can perhaps best understand the long-range significance of the religious aspects of the challenge of Japanese capitalism (and it is a challenge) if we consider the role of religion in fostering the rise of capitalism in both Japan and the nations of the West. In the case of the West, no one attempting to understand the role of religion in the development of capitalism can ignore the work of the German sociologist Max Weber. As is well know, Weber set forth the thesis that the modern Western bourgeois-capitalist world is an unintended consequence of the rise of ascetic Protestantism in the aftermath of the Reformation. Weber did not hold that religion by itself was the cause of modern capitalism. He regarded religion as a necessary but not sufficient factor in the origin of modern economic rationalism. Weber stressed that material conditions alone could not have produced the peculiar form of economic rationalism in which the impulse to accumulate was combined with disciplined restraints upon consumption. Nor could capitalism by itself have produced the kind of economic ethic needed for its development. Weber held that the economic ethic which fostered the development of capitalism was an unintended consequence of the work of the great reformers, especially john Calvin, and their followers. In its extreme inhumanity this doctrine must above all have had one consequence to the generation that surrendered to its magnificent consistency. That was a feeling of unprecedented inner loneliness of the single individual. Under the circumstance, it was inevitable that the believer seek for some hint of where he or she stood in the divine order. According to Weber, at this point economic activity took on a new meaning for the believing Protestant. Service in one’s worldly calling, even if it involved deriving profit from money itself, soon came to be regarded as offering the believer a sign of were he or she stood before the Creator. A believer who had prospered in his calling could reasonably assume that the God who had predestined all things from the beginning had been the ultimate cause of his or her well-being. The sober, methodical accumulation of wealth took on a religious meaning it had never before possessed. Thus, methodical work within the profane world became the path to overcoming anxiety concerning one’s ultimate destiny that prayer, ritual, and mystical contemplation had been in other traditions. The radical devaluation of the normal religious media of redemption by ascetic Protestantism was part of a process identified by Weber as the “disenchantment of the world.” “There are no mysterious incalculable forces that come into play,” he said, “but rather one can, in principle, master all things by calculation.” According to Weber, the roots of this disenchantment, which was indispensable to the development of the distinctive rationalism of the modern world, were to be found in the monotheistic exclusivism of biblical Judaism. By affirming a unique, supramundane, creator God, biblical Judaism denied any inherent sacrality to the natural world or to the political order. God alone was regarded as sacred. There was no longer any divine spirits in nature to be appeased, supplicated, or magically manipulated. Nor was there anything inherently sacred about the political order. Of particular interest with regard to Japan is the fact that biblical religion was especially vehement in its rejection of the institution of divine kingship. The biblical injunction, “thou shall have no other gods before me” (Ex. 20:3), was as much a political statement rejecting the divine kings of Egypt and the ancient Near East as it was a denial of animism, magic, and polytheism. The Bible’s radical desacralization of both the natural and the political order was thus an enormously significant step toward the rational mastery of the world. Nevertheless, before such rationalizing activities of the modern era as the creation of an impersonal market economy, scientific investigation, and bureaucratic organization could become culturally predominant, these activities had to be given a religiously legitimated, positive valence. Weber argued that this only became possible after ascetic Protestantism had redefined worldly activity, including the taking of interest, as a way of serving God. Neither rationalization nor Protestantism’s interpretation of wordly activity as a sacred calling could by itself have brought about modern capitalism. Only the combination of the two could have provided the “take-off” energies that made capitalism possible in the West. The development toward a purely secular, rationalized society can thus be seen an unintended sociological consequence of biblical Judaism’s “disenchantment of the world.” However, Judaism’s marginal position in the Christian West limited its ability to influence the latter’s development. The full force of biblical “disenchantment” was felt only after Protestantism elevated the authority of the Bible over that of the Church. From a social-psychological perspective, Protestantism’s rejection of the authority of the church can be seen as a revolt of the sons against the fathers. A similar revolt was indispensable for the successful displacement of traditional society by modern civilization. According to sociologist Robert Bellah, biblical region provided the legitimating that made these revolts ethically and psychologically acceptable. Bellah’s argument takes as its starting point a comparison of the father-son symbolism in Christianity and Confucianism. According to Bellah, although the father-son symbolism plays a decisive role in Christianity, the natural family has little or no religious significance. By contrast, the father-son symbolism is inapplicable to the Ultimate in Confucianism whereas the natural family has overwhelming religious significance. Contrary to both popular and Freudian belief, the biblical God was not originally a father-god but the ultimate Suzerain of a political association. The Bible does not depict God as related to Israel as the head of a natural family or as an originating ancestor. His relation took the form of a political treaty between a suzerain and his vassal. In the ancient Near East, this type of treaty was known as a b’rith or covenant. In such a pact, the superior party stipulates the conditions under which he will protect the inferior party as well as the penalties incurred for lack of fidelity to the terms of the treaty. Indeed, contemporary scholars have come to see the biblical covenant as modeled after Hittite treaties of the fourteenth and thirteenth centuries, B.C. This admonition is followed by the terrible list of chastisements that await those who disobey Israel’s God. Both Judaism and Roman Catholicism, each in its own way, sought to mitigate the potential harshness of the divine-human relationship. By insisting upon the unadorned, literal reading of Scripture, ascetic Protestantism rejected all such mitigations. By contrast, there is no sovereign, personal creator God in Confucianism. Instead, the Tao refers to the cosmic harmony of heaven, earth, and man and there is nothing comparable to Christianity’s use of the father-son metaphor. Nevertheless, insofar as religious life is founded upon the family and the ancestry cult in Confucianism, there is a coincidence between the sphere of the family and that of religion which is absent from biblical religion. Similarly, ben-Dasan points out that the Japanese find the biblical idea of God as an adoptive parent distasteful. They regard their relationship with their deities as one of blood, like that of mother and child, as in the tradition of the descent of the emperor from the sun goddess, Amaterasu-omikami. Similarly, Jesus is depicted as admonishing his followers to “hate father and mother, wife and children, brothers and sisters” as an indispensable condition of becoming his disciple (Luke 14:26). Fundamental to the Christian ethic is the injunction to obey God rather than man (Acts 5.29). Before the Reformation, only the celibate clergy and monastic orders were in theory expected to hearken to the injunction in its full severity. The Reformation radicalized and universalized the injunction by its doctrine of the priesthood of all believers. Without realizing it, the Reformers had unleashed to full revolutionary force of biblical religion’s subordination of the natural sphere of human activity, namely, the nuclear family and the extended family we know as the nation, to a supramudane principal. However, the seeds of the subordination were already present in biblical Judaism. No commandment is more central to Jewish tradition and experience that that of honoring one’s parents (Ex. 20:12; Deut. 5:16). Nevertheless, in Judaism filial piety is legitimated ab extra by the supramundane God who is the source of the commandments. When filial piety conflicts with obedience to God’s commandments, the latter must take precedence, as is evident in the Akedah, Abraham’s binding of Isaac as a sacrificial offering (Gen. 22:1-19). Ultimately, there is only one offense in biblical religion, namely, non-conformity with the will of God as expressed in the covenant between God and Israel. By contrast, filial piety is at the heart of the Confucian ethic. Unlike biblical religion, the Confucian system has no point of leverage by means of which disobedience to parents could be justified. Without willingness to breach the ethic of filial piety, as was done in Western religion, there does not seem to have been any way in which the revolutionary new beginnings necessary for modernization could have been initiated within a Confucian civilization. Nevertheless, not only has East Asia modernized and adopted capitalism, but it has done so with far greater success than Africa, the Middle East, or Latin America. Moreover, if present trends continue, first Japan and then South Korea, Taiwan, Hong Kong, Singapore, and perhaps, the People’s Republic of China are likely to outstrip Western Europe and the Untied States in economic development. Hence, the question arises whether Weber’s Protestant-ethic hypothesis has been disproven. In reality, Weber did not hold that the non-Western nations were incapable of modernization or capitalist development. He did, however, believe that the process could only have been initiated in the Protestant West. Weber argued that the material factors necessary for capitalist development were at least as favorable in China and India as in the West. Since both East and West shared more or less comparable material conditions, these could not account for the difference in development. Weber found that difference in religion. Perhaps the most fundamental insight offered by Weber is that, in addition to appropriate material conditions, traditional societies can only be transformed into modern societies by a radical redefinition of the sacred. The case of Japan would appear to confirm this insight. According to Marius B. Jensen, “The intellectual history of Japan in the first half of the nineteenth century is dominated by the consciousness of domestic weakness and foreign threat.” Even before the appearance of Commodore Matthew Perry and his “Black Ships” in 1853, word of China’s humiliation in 1842 at the hands of Great Britain had reached Japan. Shortly after China’s defeat, a questionnaire was addressed by an official of the shogunate to one of the Hollanders living in Nagasaki. The European was asked, “Why have the Tartars lost, since thy are said to be brave enough?” The Hollander replied, “Bravery alone is not sufficient, the art of war demands something more. No outlandish power can compete with a European one, as can be seen by the great realm of China which has been conquered by only four thousand men.” Given the Chinese foundation of much of Japanese civilization, China’s defeat shocked many thoughtful Japanese. It was also an event that Japanese administrators could hardly ignore. When China’s humiliation was followed by the forcible opening of Japan by Commodore Perry in 1853 and the unequal commercial treaties forced upon Japan between 1858 and 1866, Japan had the choice of either radically restructuring her society or suffering defeat and humiliation by the predatory Western powers. Moreover, Japan was threatened economically as well as militarily. The unequal treaties exposed Japan’s premodern, agrarian economy to destructive competition on the part of the industrialized nations of the West. With tariffs on goods imported to Japan set by foreigners and with Japan’s handicraft industries incapable of competing with Western factories, Japan soon found herself flooded with manufactured foreign goods that had the effect of ruining much of their domestic handicraft industries at a time when her currency was rapidly depreciating and high inflation was dangerously distorting her domestic economy. As we knew, the foreign threat was met speedily and successfully by perhaps the most radical restructuring of any society the world has ever known. One of the most remarkable aspects of Japan’s modernization is that it was carried out with relatively little bloodshed. The samurai elite responsible for the Meiji Restoration of 1868 were genuine revolutionaries who had largely emerged out of a group of dissidents from the lower strata of their class. Crucial to the success of their revolution was the transformation wrought in the imperial office whose sacred charismatic character is deeply rooted in Japan’s earliest history. Just as religion had played a crucial role in the modernization of the West, so too a very different kind of religion, one that rested upon the archaic institution of divine kingship, played an equally important role in Japan’s modernization. For our purposes it will suffice to take brief note of the character of the imperial office in the sengoku, Tokugawa, and Meiji eras. In the sengoku jidai period, the “period of the warring states” that preceded the Tokugawa shogunate, the emperors were often bitterly impoverished yet their office symbolized sacralized legitimate authority. The emperors were influential political rulers who could influence politicos but could not rule. The tokugawa shogunate brought to an end whatever overt political authority the emperors possessed. The shogun assumed almost all of the political prerogatives of the imperial office, such as the bestowal of titles of nobility, the right to veto the appointment of court officials, and the right to govern those Buddhist monasteries formerly controlled by the imperial court. At the same time, the material conditions of the imperial court were greatly improved and the imperial office was treated with genuine reverence. Scholars responsible for formulating loyalist ideas concerning the throne in the late eighteenth century even discerned a causal connection between the Tokugawa shogunate’s ability to pacify the country and its respectful attitude toward the emperor. During this period, the emperor was the head of the state and the shogun the functioning head of government. It was fortunate for Japan that this division of authority existed in the period immediately preceding modernization. Had the supreme sovereign been the functioning head of government in the 1850s, his policies rather than the shougun’s might have been discredited. As a result, there might not have been any institution to guarantee the continuity of legitimate authority from the premodern to the modern period and the Japanese would have been far less able to withstand the deterioration of their indigenous institutions in the face of the Western challenge. As it was, the period between 1860 and 1880 witnessed a tendency in Japan, by no means shared by all leaders, to overestimate Western culture and institutions and to denigrate their own indigenous institutions. It is also likely that Christianity would have made far greater inroads in Japan had the imperial office been discredited. We shall return to this question shortly. The role of the monarchy changed in the Bakumatsu, or late Tokugawa period. When it became apparent that the shogunate was unable to cope with the challenges confronting Japan, there were occasions on which expressions of political preference were enunciated in the name of the Emperor Komei, such as the refusal to ratify the treaty of 1858. However, even in this period, reverence to the throne did not normally involve direct imperial rule. The Sacred Throne was established at the time when the heavens and earth were separated. The Emperor is Heaven descended, divine and sacred; He is preeminent above all his subjects. He must be reverenced and is inviolable. He has indeed to pay due respect to the law, but the law has no power to hold him accountable to it. Not only shall there be no irreverence for the Emperor’s person, but also He shall not be made topic of derogatory comment nor one of discussion. As in the early Tokugawa period, the emperor’s position was once again exalted. In addition, the policies of government were now depicted as representing the “imperial will.” At the same time, the emperor lost the ability to speak independently of his counselors. By transferring the emperor’s residence from Kyoto to Edo, exalted though his position may have been, he spoke, if at all, through the oligarchs who governed in his name. No longer could dissidents claim to speak on his behalf in opposing the polices of government. The ceremonial aspects of the imperial institution were exalted, the emperor was effectively isolated from dissidents, and power was exercised in his name. When we compare the extreme social and political disorders that accompanied the transformation of traditional into modern capitalist societies in the Christian West with the relatively bloodless transformation that took place in non-Christian Japan, the Japanese achievement appears truly impressive. Unlike their modernizing counterparts in the English Revolution of the Seventeenth century and the French Revolution of the late eighteenth century, who purchased the transformation of their respective societies with regicide and civil war, the modernizing elite of Japan succeeded in rationalizing the economy and society of their nation with a minimum of domestic violence or alienation of elite classes and institutions. By utilizing a seemingly conservative doctrine, that of the emperor’s divinity, to legitimate a radical social and political revolution, the elite was able to create a strong central government, abolish all estate distinctions, eliminate warrior privileges, open military service to commoners hitherto forbidden to possess arms, establish a system of universal public education, and facilitate the entry of members of the samurai class (in general the best-educated class) into the world of business and commerce. All this was done without the transformation of traditional elites and institutions into embittered enemies of the new social order as was so often the case in Europe. Modernization and political centralization were carried out under contrition of far greater social cohesiveness and stability than was the case elsewhere. The doctrine of the emperor’s divinity, his status as a “living kami,” was crucial to the expeditious creation of a strong, centralized government that could replace the shogunate and establish an effective modern economy. By subordinating all other loyalties to loyalty to the emperor, the samurai were enabled to transfer their allegiance from local leaders–who in many cases could no longer support them–to both the leader of the new centralized state and, perhaps of greater importance, to the oligarchs and bureaucrats who claimed to speak on his behalf. This was a precondition of successful modernization in an era of heavy industry requiring large-scale capital investment. Japanese modernization involved the blending of the most archaic traditions, albeit renovated under the pressure of new dangers, with the imperatives of economic, political and industrial rationalization. We have already noted that a pre-condition of modernization in the West was the weakening of the value of filial piety. No such rejection was necessary for Japanese modernization. Apart from religion, filial piety had to be breached in the modernizing West in the relations between sovereign and subject. Normally, the Western “carriers” of modernization were the urbanized commercial classes rather than absolutist monarchs. The latter facilitated the modernization of the polity by creating a state administration, based on merit but they were seldom inclined to subvert social hierarchies by favoring the unorganized carries of modernization over the nobility whose roots were largely agrarian. Class warfare, often religiously legitimated, was an almost endemic by-product of Western modernization. By contrast, the social transformations necessary for memorization in Japan were initiated from the top down rather than from the middle up. Instead of abrogating filial piety, that value became an indispensable component of Japanese modernization. Although we set out to take in the best features of the West and bring in new things in order to achieve the high aims of the Meiji Restoration . . . this procedure had a serious defect: it reduced benevolence, justice, loyalty, and filial piety to a secondary position. The danger of indiscriminate emulation of Western ways is that in the end our people will forget the great principles governing the relations between ruler and subject, and father and son. Our aim, based on our ancestral teachings, is solely the clarification of benevolence, justice, loyalty, and filial piety. The contrast with earthbound, non-nomadic Japan, a nation that has never forsworn her most ancient gods nor thought of these spirits as separate from nature, could not be greater. Japan’s modernization was predicated upon unconditional reaffirmation of the sacred connection between the modern state and its most archaic roots. One of National Socialism’s long-range objectives was to eradicate the biblical heritage in Germany and regain Germany’s archaic inheritance. The Japanese did not require the social and political violence inherent in National Socialism to remain touch with their roots. Unlike every nation of Judaeo-Christian inheritance, the Japanese alone remain in contract with their oldest sources of religious and cultural values. Moreover, the Japanese have so structured their society and their economy that they will have no motive to abandon their most ancient traditions. The Egyptian state was not a man-made alternative to other forms of political organization. It was god-given, established when the world was created; and it continued to form part of the universal order. In the person of pharaoh a superhuman being had taken charge of the affairs of man. And this great blessing, which ensured the well-being of the nation, was not due to a fortunate accident but had been foreseen in the divine plan. The monarchy then was as old as the world, for the creator himself had assumed kingly office on the day of creation. Pharaoh was his descendant and his successor. When in 1945 the victorious Americans used their political leverage to secure the emperor’s denial of his divinity, they were responding to the institution of divine kingship in a way that accorded with their age-old biblical tradition. Because of the cultural predominance of sectarian Protestantism in the United States and the absence of feudal inheritance, American culture has been more strongly influenced by biblical religion than any other Western country. According to William P. Woodard, who served as an adviser on religion to Gen. Douglas MacArthur’s occupation administration, the general was conscious of being called by the biblical God for the hour, and regarded himself as the leader of the Protestant world “as the Pope was the leader of the Catholic world.” Although the general later moderated the tone of his remarks, in the early years of the occupation, MacArthur made unfavorable comments about both Buddhism and Shinto. He favored the return of Christian missionaries in large numbers to Japan and saw the occupation as an unparalleled opportunity for the conversion of the Japanese to Christianity. MacArthur saw himself as called by the God of the Bible to lead the Japanese out of what he, as a believing Christian, regarded as their spiritual ignorance. In spite of apparently favorable circumstances, the postwar missionaries who came to Japan quickly discovered that few, if any, free countries offer less promise to Christian missions than Japan. After more than a century of strenuous efforts, with one of the world’s largest concentrations of foreign missionaries, almost 5,200 in number, Japan remains more resistant to Christianity than any other developed country. Less than 1 percent of the population is Christian and the numbers are declining. By contrast, many observers anticipate that neighboring South Korea, whose Christian population comprises almost 25 percent of the whole, will have a Christian majority by the year 2000. Apart from the fact that Christianity is rejected as “un-Japanese” by a population with a very strong sense of group identity and a strong distrust of anything foreign that cannot be readily assimilated, the Japanese find the biblical conceptions of an omnipotent, extramundane Creator who establishes a covenant with a non-Japanese group utterly lacking in credibility. Japanese believe themselves to be descendants of a race of gods and their emperor a direct descendant of the sun goddess, but as we have seen, descent is an organic rather than a conditional relationship as in the case of the covenantal relationship with the transcendent Creator God. Another respect in which the paths to modernization taken by Japan and the United States have been profoundly different has been the “disenchantment of the world.” As noted above, biblical monotheism, with its affirmation of one sovereign Creator god and its persistent tendency to desacralize both the natural and political orders, led to “disenchantment,” that is, the rejection of animism, polytheism, and magic in the civilizations that derived from biblical religion. Contemporary sociologists of religion tend to concur in Weber’s judgment that biblical “disenchantment of the world” was an indispensable precondition of the rationalization of the economy and society characteristic of Western capitalism. It is precisely that which a “disenchanting” religion rejects, namely, animism and polytheist, that Shinto affirms. Here again, indigenous Japanese religion the polar opposite of the biblical tradition. 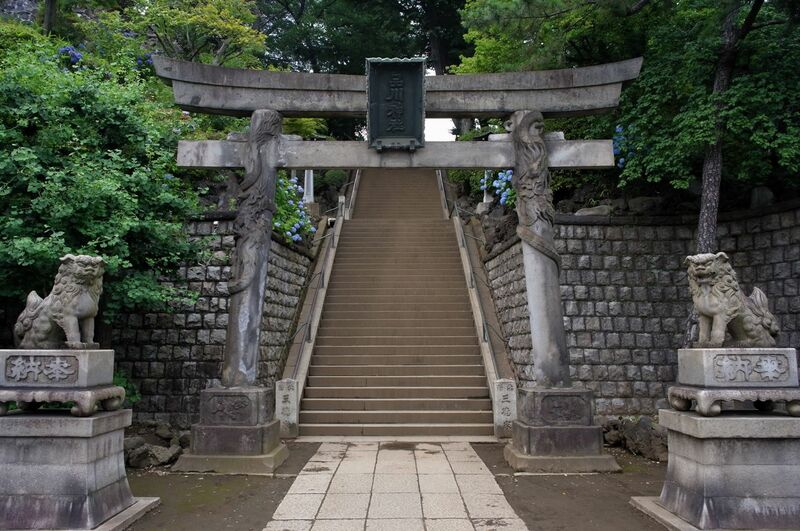 Moreover, it should be noted that, in spite of its animism and polytheism, Shinto plays a significant role in contemporary Japanese business, science, and technology. For example, among the leading corporations that have Shinto shrines at their headquarters, branches, and industrial establishments are the Sanwa Group, Toyota, the Mistsubishi group, Hitachi, Toshiba, and Matsushita. Konosuke Matsushita, founder of the giant Mastushita Electric Company (Panasonic, Quasar) and one of this century’s preeminent Japanese business leaders, has served for many years as president of the Worshippers of Ise Shrine, Japan’s most sacred shrine. Groundbreaking ceremonies for new factories usually involve a Shinto ritual, as was the case at the groundbreaking ceremonies for Mazda’s new automobile factory in Michigan and the jointly owned Chrysler-Mitsubishi American factory. The governor of Michigan was in attendance at the two-hour ceremony for the Mazada factory. Biblical religion and indigenous Japanese religious tradition have thus provided alternative paths to the modern capitalist world. Biblical religion alone, with its denigration of filial piety and its tradition of relativizing human institutions in the light of the ideal of service to a sovereign Creator God, possessed the psychic mechanism to begin the monumental breach with the past implied in modernization. It alone had a value system that legitimated the break with the past as service to an ultimate principle. Furthermore, by eliminating the necessity to appease any spirits or divinities thought to inhere in the natural or political order, biblical “disenchantment” fostered the functional rationality in finance, scientific experimentation, bureaucratic organization, and the processes of production that were indispensable to the creation of the bourgeois capitalist world. One can say without exaggeration that the modern Western world is largely an unintended consequence of the cultural triumph of a biblical understanding of the nature of things. Nevertheless, if Japan did not have a value system capable of initiating a fundamental breach with the past, it did have the religious and cultural resources necessary to defend its civilization against the West. And it has done that with astonishing success. As noted, modernization in Japan was essentially a defensive strategy. Its first objective was to secure Japan against against Western military aggression, its second was to defend Japan against Western economic aggression. Its ultimate purpose was to defend Japanese civilization against the destruction of its historic values that would most assuredly have ensued if Japan as a nation had been converted to any form of biblical religion. Japan would have been compelled to abandon the gods and ways of its ancestors as surely as had Abraham’s progeny in Judaism, Christianity, and Islam. The Japanese tend toward polytheism rather than monotheism. We believe in many gods and consider ourselves part of nature’s unending cycle. There is broad and general acceptance of the idea that a man’s fate is inseparable from that of every animal, tree, and blade of grass. Side by side with this is the Indian concept that each man is the whole of nature unto himself–as is evident in Zen philosophy as well. The Japanese combine both of these concepts, oneness with nature and the individual as the whole of nature, within their being. It is my belief, however, that our sense of oneness with nature is indigenous and goes back to our Jomon roots. Japan’s ancestor worship is thus quite different from Christianity’s contract between man and his monotheistic god. In the process of honoring our forefathers, we create the harmony which is such an integral part of our life-style. Since the change was merely a change in outward treatment, it is only natural that the Shinto of the imperial House and Shrine Shinto should still be considered orthodox. It is one of the noteworthy peculiarities of Shinto as a religion that, since these types of Shinto are not bound by dogmas and scriptures but preserve their life in traditional form, [insofar] as there is no great impediment in the continuation of the religious rituals, the wounds inflicted by this change are not too deep. The divinity of the emperor was never considered comparable to that of Jesus in Christianity or God in biblical Judaism. The emperor was thought of as ikigami, “a living human kami.” The term refers to outstanding servants of the nation who might be enshrined and worshipped while still alive. Imperial princes, national heroes, Shinto priests, and the emperor can all be reverenced as ikigami. To the Japanese, the emperor remains the supreme living kami. At present, his status is somewhat ambiguous. As Japan’s power continues to grow, there is every likelihood that the ambiguity will be clarified in favor of the traditional understanding of the emperor’s divine status. Unlike most allegedly primitive indigenous religions, Japanese religion has demonstrated its power to inspire a capitalist civilization capable of competing successfully with the West in almost every significant sphere of human activity. Seldom, if ever, has the monotheistic exclusivism of biblical religion been challenged as successfully as it has by modern Japan. It should be obvious that this writer has a very profound respect for the achievements of Japanese civilization, especially in the Meiji and post-World War II periods. Nevertheless, he feels constrained to conclude by raising an issue that may prove to be of considerable importance in the years ahead. Those who fault biblical religion for its exclusivism tend to overlook one of its principal strengths, namely, its ability to unite men and women hitherto strangers to each other in a new community of worship and moral obligation. Indeed, the covenant at Sinai served that function when it transformed a “mixed multitude” of escaped fugitives into a community united in worship of the God who redeemed them from Egypt. Enlarging on an impulse already present in Scripture, Christianity was able to create a community of moral obligation that transcended old religio-communal boundaries of ethnicity and common descent. It is perhaps no accident that the United States is both the modern nation most committed to biblical religion and to the absorption of an immigrant population of every race, color, and creed. If, as ben-Dasan asserts, the relation between Israel and God is “artificial” rather than organic, the bonds the Founding Fathers created to unite Americans were also a matter of human invention, losing none of their potency thereby. By contrast, while Japan has been most successful in defending the integrity, continuity, and organic character of its civilization, its indigenous traditions offer little basis for a wider base of community than that which rests on kinship and common descent. Apart from the obvious constraints Japan’s limited space imposes upon the size of her population, Japan is, of all modern nations, the least able culturally and psychologically to absorb new immigrants, as, for example, in the case of Koreans who are often physically indistinguishable from Japanese. Here again, Japan and the United States are polar opposites. In view of the overwhelming international importance of Japan, one must ask whether she can any longer ignore the problem of finding a more universal basis for community than offered by her indigenous traditions. Were Japan a minor provincial power, this issue might be of little consequence. However, Japan is not a minor power but a world leader and there is a profound conflict between the traditions that have enabled Japan to achieve her current position and the universal responsibilities that position demands. Whatever shortcomings can be discerned in biblical religion, it has repeatedly demonstrated its capacity to enlarge humanity’s sense of community. The question of whether Japan has the indigenous spiritual resources to enlarge her sense of community may be the most important confronting her in the coming Pacific era.